Looking to save some cash on a console? 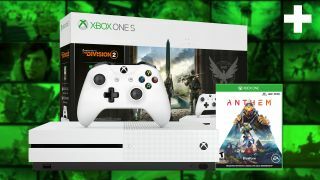 The best Xbox One bundle for you would probably be the S model, so we’ve gathered up the best Xbox One S bundles, prices and deals to get you started. You’ll find bargains with games both new and old right here. These offers are updated every week, too. The disc-less model of Xbox One can be pre-ordered here. It comes with Minecraft, Sea of Thieves, and Forza Horizon 3. What makes them the best Xbox One bundles, though? Well, the S is much more affordable than other Xbox Ones in the range. In fact, you can get it for $200 or less. That makes it the cheapest system around. Although it’s not the most powerful console out there (it can’t display games in 4K), the S will still play every Xbox One game in 1080p HD. What’s more, it’s a dependable multimedia machine as well. Besides providing High Dynamic Resolution (HDR) to make the colors on your TV more vivid, it also has a built-in Blu-Ray player that can play 4K movies. Basically, it’s a great all-rounder. That’s why the best Xbox One s bundles, prices and deals get snapped up fast. Want a little more horsepower in your console? No problem. Take a look at these Xbox One X deals. You’ll also find good savings in our guide to cheap Xbox game deals, including tips on how to get an Xbox One controller cheap and Xbox One accessories. If you’re looking to save some cash, already have games, or want to upgrade your original Xbox One, buying a console by itself is a valid option. While it’s not always the best value for money (bundles often give you games for free), there are savings to be made if you know where to look. What's more, the S is 40% smaller than the launch-edition Xbox One so will fit snugly in your entertainment centre.